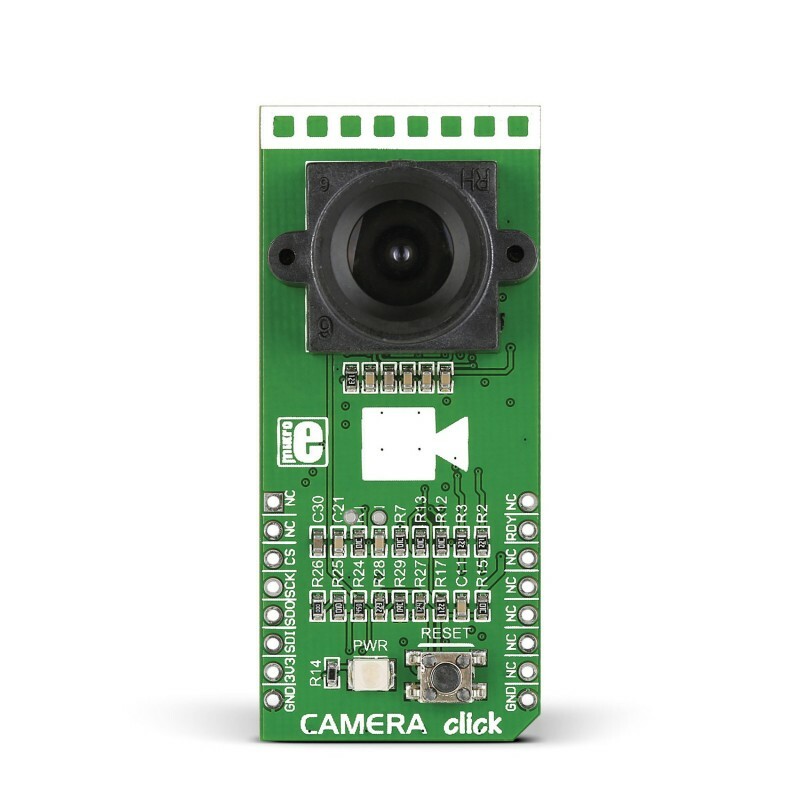 Camera click carries OV7670-VL2A, a low voltage CMOS image sensor, connected to an onboard FT900 MCU through a parallel camera interface. 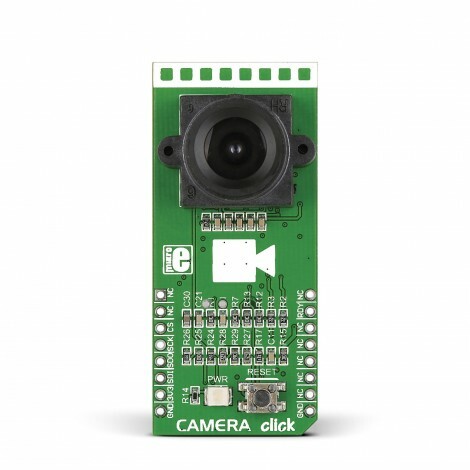 Camera click carries OV7670-VL2A, a low voltage CMOS image sensor, connected to an onboard FT900 MCU through a parallel camera interface. 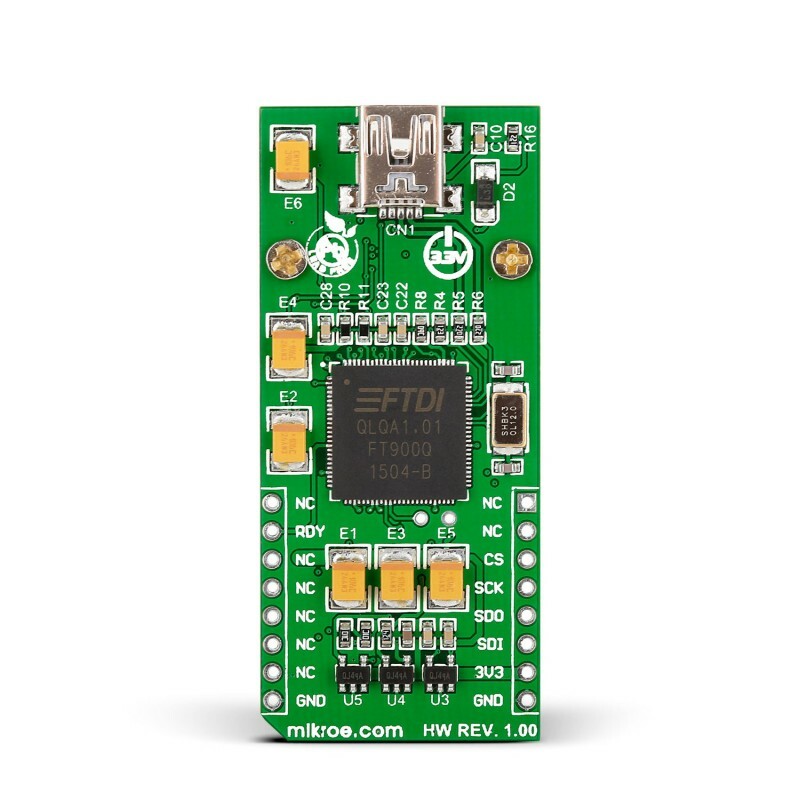 The FT900 in turn outputs the camera image to the target board microcontroller through the mikroBUS SPI interface (CS, SCK, MISO, MOSI). An additional RDY pin (INT) signals the camera’s status. 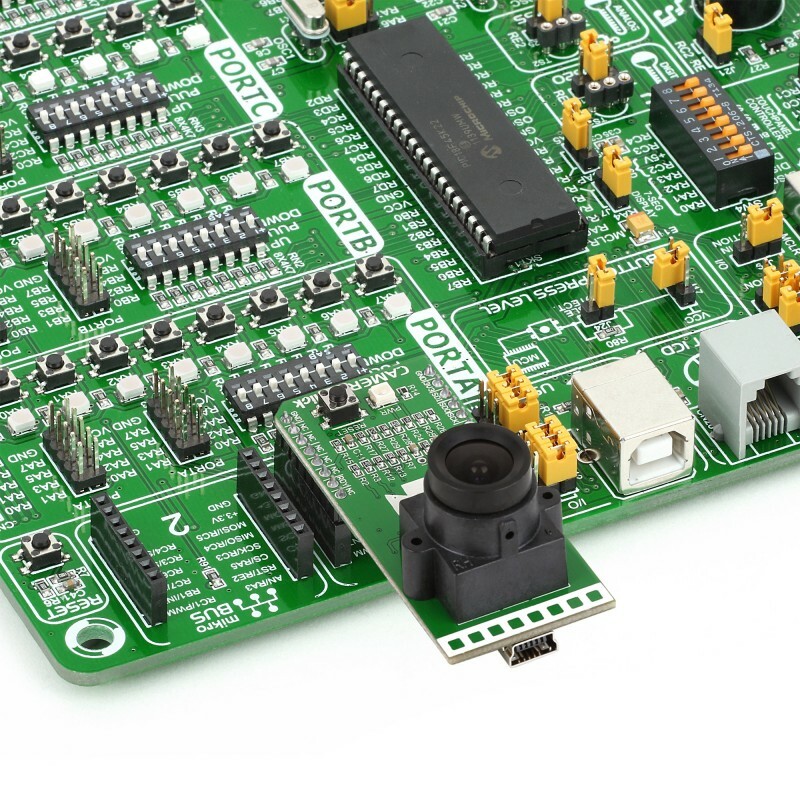 Camera click combined with a 32-bit target board MCU will enable you to stream QCIF resolution video (176 x 144 px). Increased processing power and storage capabilities will get you better results (the maximum resolution of the OVO7670 sensor aboard camera click is VGA, 640x480). With 8-bit MCUs, camera click is best used for rendering static images, or for specific applications where a few frames per second are enough. If you want to stream QCIF resolution video and take 640x480 images, and have good storage capacity, you don't need to look further than Camera click. This click features the OV7670-VL2A low voltage CMOS VGA image sensor. The OV7670 provides full-frame, sub-sampled or windowed 8-bit images in a wide range of formats. The OV7670 is connected to the onboard FT900 MCU through a parallel camera interface. The FT900 outputs the camera image to the target board MCU through the mikroBUS™ SPI interface (CS, SCK, MISO, MOSI). Additional RDY pin (INT) signals the camera’s status. 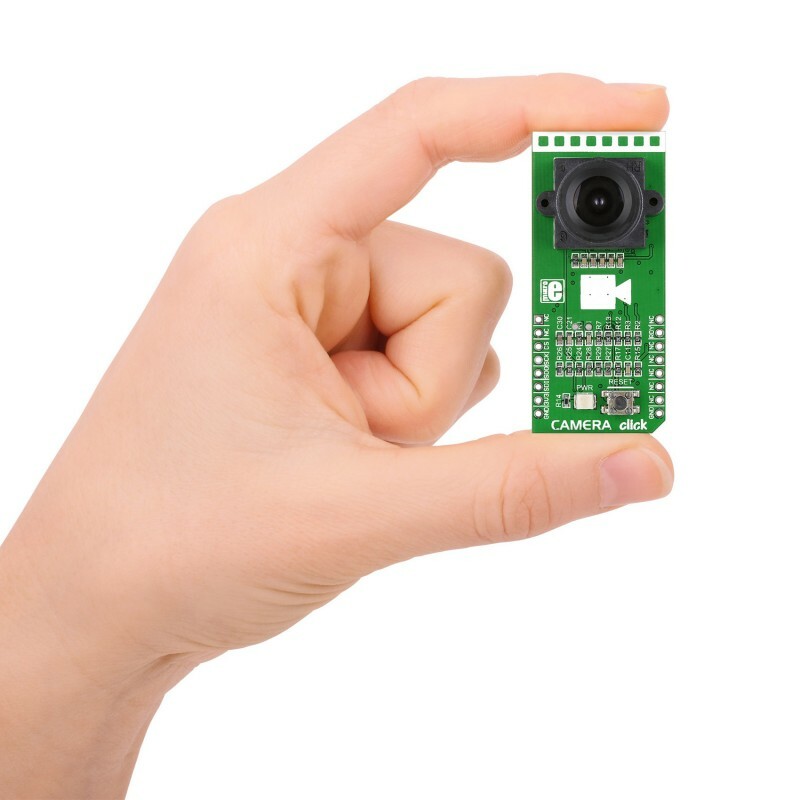 When it comes to video, Camera click combined with a 32-bit target board MCU will enable you to stream QCIF resolution video (176 x 144 px). The processing power is the bottleneck, not the sensor itself, which can capture VGA picture. 1. VGA or video graphic array cameras are the low-cost option for taking lots of photos, so they are an excellent choice for security cameras because the images are clear enough to recognize faces and larger letters, but the resolution is low enough (640x480) so that it does not take up too much storage space. VGA cameras can also be used for other devices, like toys, very low quality front-facing cameras on phones, traffic control. 1. Maximum image transfer rate is 30 frames per second. All the image processing functions are available through the SCCB interface (exposure control, gamma, white balance, color saturation, hue control and more). 2. Power consumption: in standby mode the module uses 12μA. The click runs on 3.3V power supply only. With 8-bit MCUs, camera click™ is best used for rendering static images, or for specific applications where a few frames per second are enough. This table shows how the pinout on Camera click corresponds to the pinout on the mikroBUS™ socket. The Libstock example shows the Read/Write and Card Emulation modes of the Camera click.